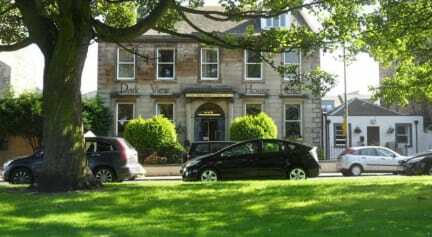 Our Hotel was built in 1860 as a detached, Victorian, elegant family home. This warm and welcoming 3-Star non-smoking establishment has been transformed into 17- En-suite bedrooms. A selection of Double, Twin, Triple, Family and Deluxe Family rooms, enabling us to accommodate everyone from single travelers, couples, to families and larger groups. Tea and coffee-making facilities, flat-screen Free view TVs, free Wi-Fi access. Some rooms also offer views over Leith Links Park, which hosted the first ever Open Golf Tournament in 1744. 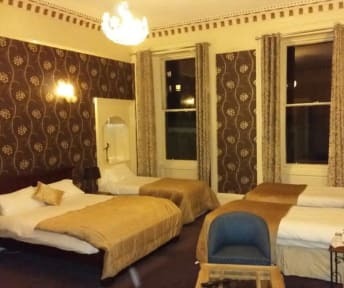 We offer the perfect base from which to explore Edinburgh, with a mixture of bars and restaurants to suit everyone’s tastes, as well as all the famous landmarks. For example; Edinburgh Castle, The Royal Mile, Arthur’s Seat, The Royal Yacht Britannia, and The Scott Monument. The list is endless, and they are all easily accessible by car, bus or on foot. Just outside of Edinburgh there is also Roslyn Chapel famous for its history and inclusion in the film “The Da Vinci Code. We have a free, secure private car park available to all guests, as well as FREE on-street parking at the front of the properties. Direct buses to the hotel/holiday Let are available from Waverly Station (No.25), From Edinburgh Airport (Stand F No. 300 which includes a short walk). All in all, whether you staying for business or pleasure, we’re confident your stay with us will be an enjoyable, comfortable and convenient experience. From the team here at The Park View House and Hotel, we look forward to welcoming you upon your arrival. Once a booking has been made and security such as a credit card number or deposit has been given to reserve the room, then it means that we have a 'confirmed reservation'. PLEASE NOTE: A £25.00 BOOKING FEE WILL BE CHARGED BY THE HOTEL (NON REFUNDABLE) TO VERIFY CARD DETAILS THIS WILL BE DEDUCTED FROM AMOUNT OWED ON ARRIVAL IF NOT CANCELLED. You may check into your room from 14:00 on the day of arrival. All guests arriving after the 22:00 check in time must advise a member of staff on their time of arrival. A late check in fee of £10 per room per hour will be charged. This will be added on top of your remaining balance and will be charged on check in. Please advise members of staff on time of arrival. There is someone in the hotel 24/7 but not at front desk 24/7 this charge enables us to pay for a staff member to stay on front desk until the guest arrives. Thank you. 10:30am 7 days a week. Late checks can be arranged at a charge of £10.00 per hour up to 2 hours. If you require longer the full daily rate would then apply. An additional fee will apply when paying by credit card. Book in January February, November and December. FREE cancellations up to 13:00 the day before arrival. Book in March, April, May, June, September and October. Booking in July and August, or for Christmas & Hogmanay fortnight, Easter, and Six Nation rugby events.